We’re here at Dreamforce, Salesforce.com’s annual cloud computing event in San Francisco. CEO Marc Benioff is delivering the keynote and we will be live-bogging the news below. Salesforce has had a banner year, reporting strong earnings yesterday for the third quarter, launching a new version of their fastest growing product, Service Cloud 2; and rolling out a lightweight contact manager for small businesses. So what is the future? Benioff has long praised the virtues of the real-time cloud and said recently that real-time technology is not only crucial to Salesforce’s offerings but is the future of the company’s products. Benioff has even praised Twitter for making the transition between the cloud and real-time web seamless. Today, Salesforce is making its own venture into the stream with Salesforce Chatter which allows any company to collaborate in real time with a secure, private social network for their business. Content, applications and people will now have profiles, feeds and groups, enabling them to be connected. In addition, developers will now be able to use the Salesforce Chatter platform to build social enterprise applications, and all 135,000 native Force.com applications will be able to tap into Chatter. Salesforce Chatter will let users post profiles, like on Facebook, which include things like contact information, area of expertise, work history and a photo. The social network will also include the ability to post real-time status updates. And Salesforce is tapping into the real-time stream that will feature status updates, not only from people, but also from content and apps. Content will notify users in the Salesforce Chatter feed when new or updated content is available. Apps will join the conversation by posting when there is a change in status, like when an opportunity closes or a case is escalated in Salesforce CRM. Salesforce Chatter will also allow users to create groups within the social network. Similar to Facebook, users will be able to post content, like documents, spreadsheets and presentations, in Salesforce Chatter’s feed. Companies can decide which employees have access to certain information on a network, with a multi-tenant sharing model. Of course, Salesforce Chatter will enable users to filter the most relevant Twitter feeds into their Chatter app. For example, a user can set-up a Twitter search for a competitor and automatically stream the real-time results into Chatter. Employees will also be able to pull information from their Facebook profiles to auto populate their Salesforce Chatter profiles. Any native app built on the Force.com platform can stream updates to Salesforce Chatter’s feed. And with all salesforce.com apps, Salesforce Chatter will be available on the BlackBerry, Windows Mobile devices or iPhone. 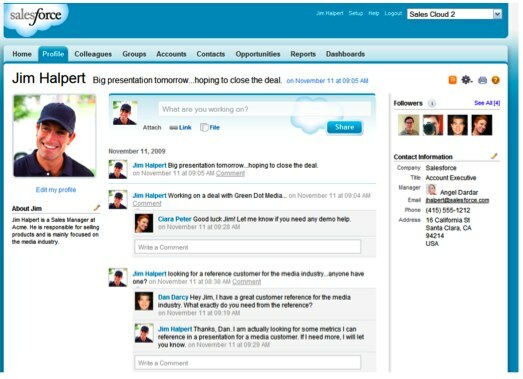 Salesforce Chatter is currently scheduled to become available in calendar year 2010 and will be included in all paid editions of Salesforce CRM and Force.com. Chatter will also be sold for $50 per user per month and will include Salesforce Chatter, Salesforce Content and Force.com. Benioff says that Salesforce Chatter is the “magic of Facebook and Twitter brought to the enterprise.” But the feed itself looks similar to FriendFeed. Benioff will also be revealing more about Salesforce Chatter and his real-time strategy at TechCrunch’s Real-Time CrunchUp on Friday, November 20.